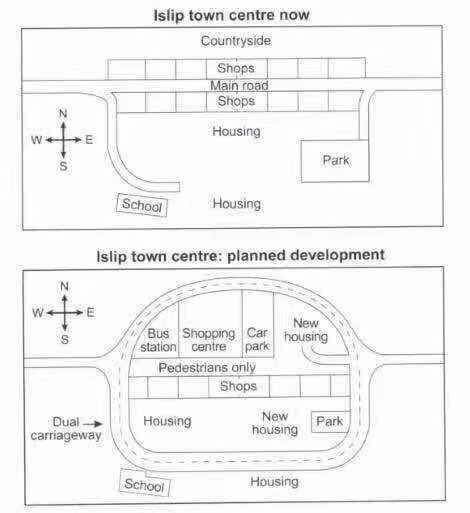 The two maps illustrate a comparison between the future and the present layout of Islip town center. The most noticeable change is that a dual carriage way 【遇到名词的时候，考虑有没有修饰/补充信息的可能性：同位语、从句、动词分词、形容词短语等形式】, a loop that contains most of the town center’s facilities, will be built as a replacement of the current main road 【遇到名词的时候，考虑有没有修饰/补充信息的可能性：同位语、从句、动词分词、形容词短语等形式】, a straight west-east way going through the town center. 【Grammatical Range: 主系表结构、表语从句、同位语、定语从句、动词分词作后置定语】 The school and residential area outside the loop will remain south of it. 【忌讳：过分描述每个建筑物的详细位置/占地/数量】 Changes will also happen to the core of the town center. It is most noteworthy that the shops on the north side of the present main road will be removed, and the land will be redeveloped with a bus station, a shopping center, a car park and a new housing area built as replacements of the shops. 【Grammatical Range: 主系表结构、主语从句、介词短语作状语】Meanwhile, the main road will prohibit all vehicles. Also, the plan affects 【不对动词否定，而对名词否定】 neither the location nor the number of the shops on the south side of the main road, while the eastern part of the current housing area will be revamped. In addition, the park will stay where it is but with a shrinkage. 1） 定语：This is the place where I was born. 2） 名词：This is where I eat. Overall, the town center of Islip, according to the development plan, will be more complex and multi-functional. The graphs below show the layout of the southern side of a museum in 2008 and its changes in 2012. The two maps illustrate a comparison between what a museum’s south wing was like in 2008 and what it was like after development in 2012. From the west to the east, there are a number of changes. The special collective gallery on the west end stayed unchanged. Replacing the original entrance, an entrance hall was built straight to the stairs. With a restaurant as an addition to the north side, the middle section was expanded. While the interactive gallery and the shop were the same as they were before, the gallery was developed into a dual-functional space with a cloak room. The east end was also expanded. Where the stairs were in 2008, there was an elevator instead in 2012. The space shared by a reading room and a cloak room was divided into two separate rooms—the reading room and a section designated for children replacing the cloak room. Next to the reading room was a self-service café, with an exhibition room still next to it. Overall, the whole section of the museum changed markedly into a more versatile area. The diagram shows the fire plan for the second floor of a student dorm building of a university. 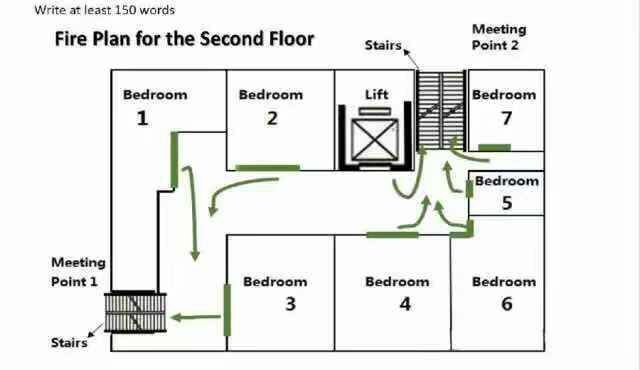 The diagram illustrates an evacuation plan for the second floor of a particular student dorm building in case that there is a fire. Two routes 【遇到名词的时候，考虑有没有修饰/补充信息的可能性：同位语、从句、动词分词、形容词短语等形式】 , which lead to two assembly points, are available for evacuation when a fire happens. Meanwhile, tenants should use the two routes with caution: they should not go through the west-east corridor but use the nearest exits and. Assembly Point 1 is located at the southwest corner of the dorm building, and it should be used by tenants in Bedrooms 1, 2, and 3. For tenants living in Bedrooms 1 and 2, they should go through the west corridor and use the stairs at the end to escape. Since Bedroom 3 is directly facing the stairs, residents in that room can go straight to the stairs and leave the building. Bedrooms 4, 5, 6 and 7 as well as the elevator are close to the other meeting point 【遇到名词的时候，考虑有没有修饰/补充信息的可能性：同位语、从句、动词分词、形容词短语等形式】 – Assembly Point 2, and residents and passengers should therefore use the east corridor and the corresponding stairs 【遇到名词的时候，考虑有没有修饰/补充信息的可能性：同位语、从句、动词分词、形容词短语等形式】 , adjacent to Bedroom 7 at the northeast corner, to reach that meeting point. Overall, the evacuation stairs and meeting points are respectively easily accessible from the two sections of bedrooms and the elevator. GMT+8, 2019-4-20 16:20 , Processed in 0.117023 second(s), 29 queries .